Before you ask, no, the PS3 isn't getting an Xbox 360-equivalent Facebook interface in today's version 3.10 Facebook-angled firmware release. That's the bad news. The good news, if you're PS3-do-or-die, is that it actually adds a few bits Microsoft's implementation doesn't support yet. 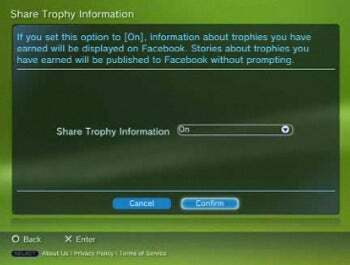 For starters, the newly integrated Facebook icon--it's parked at the bottom of the XMB's account management menu--allows you the option to pipe game trophies direct to your Facebook news feed as they're acquired. Existing trophies come across in bundle updates--no deluges of individual bronze, silver, and gold missives cluttering your news outflow--after which they'll ping in dynamically, one at a time. You can also opt to share your PlayStation Store purchases and in-game events, but what about the tempest in a teacup over Uncharted 2's game event Twitter updates? What if you want to filter specific events and purchases? "We put a lot of things in place to make it really flexible," said PSN director Eric Lempel in a phone interview. "So you can post what you'd like to post, especially if you're playing a game that maybe you don't want all your friends knowing about." Translation: If you turn on game events or store purchase information, you'll be prompted by the system each time there's an opportunity to post something--nothing goes out without your say-so. "For example, say you're in a racing game and you've just scored record time on some track," said Lempel. "You'll then get a note asking if you want to post the record to Facebook. You'll just click a button to say 'yes' or 'no'." Which events qualify for updates? "That'll be up to individual developers," said Lempel. By contrast, trophy information gets pushed out automatically, meaning it's all-or-nothing when the option's enabled. "We didn't want trophy-sharing to become something intrusive in the games," said Lempel. "And just the way it works technically, it's the best way for that to happen." Trophy synchronization's been a sore point for some PS3 gamers, who dislike that it has to be performed manually, or that it can take awhile to complete. I asked Lempel whether Sony plans to automate or speed up the process. "Not at this time," he said. "You're still synchronizing trophies as you do today in this update, by either clicking on the trophy icon or comparing your trophies to a friend's."